There's nothing more inspirational than somebody who is truly passionate about what they do, and on Friday evening, I had the pleasure of meeting just such a person - Alex Danson, a Bronze Medal Winner at London 2012. 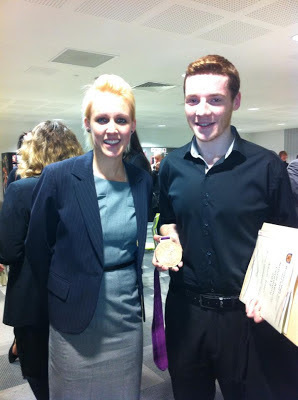 Afterwards, I was able to chat with Alex and hold her Bronze Medal. I can honestly say she is incredibly down-to-earth, a fantastic ambassador for her sport, and a true inspiration! You'll remember one of London 2012's goals was to "inspire a generation", and Alex - along with the other members of Team GB - has certainly done that and continues to reach out and inspire young people. So, as well as being commended for my achievements throughout recent years, I found myself inspired to do even more in the future, because if you put all you can into everything you do, you'll never regret a thing!